One of the Donquixote Family's officers. She was abandoned by her mother at a very young age for being useless, which shaped her personality to this day. She cannot turn down requests, she is happy when people need her, as she was proposed 7 times by men with ulterior motives and she agreed instantly. Those men have since been killed by Doflamingo. 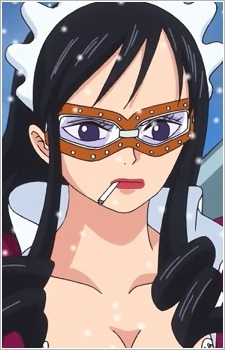 During the battle of Dressrosa, misunderstandings during her fight with Sai lead her to believe Sai is proposing to her. After seeing her being unable to turn down any requests, Sai vowed to maker her his wife and defeated Lao G.